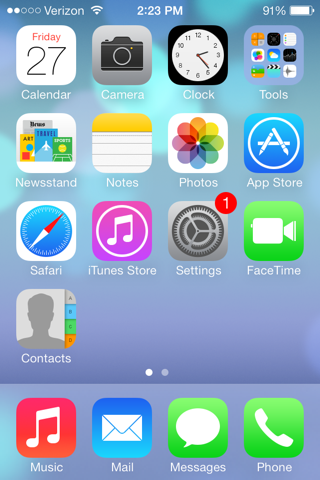 The recent release of Apple’s iOS7 (and 5S and 5C phones) has been one of the biggest headlines in recent memory. And that’s not just a statement on the countless articles on the subject on the internet, but a statement on how it’s bled into everything around me. Several times now in public places I’ve overheard conversations that start something like, “So have you updated to iOS7 yet?” But I suppose if you stop to think about it, everyone knows at least one other person with an iDevice (I’ve heard people use that term in conversation; I’m curious if that’s how it’s meant to be typed out). And would you know it, Apple made an absolute killing. That’s not to say I wasn’t excited when I started to install it. To be completely honest, it wasn’t the new features that were what got me all giddy. No, folks, I’m a sucker for flashy new icons and interface (I wonder if this is what it’s like to jailbreak an iPhone and install a new theme). To be excruciatingly reductive, it’s essentially the same phone I had last week, except everything looks different (I say different, because to describe the design would be completely subjective). And you know what? I really like the new user interface. That being said, I’ve had a good month to decide whether I liked it or not, hence my anticipation of installation. However, the new features are something I had to discover organically. And what do I think? 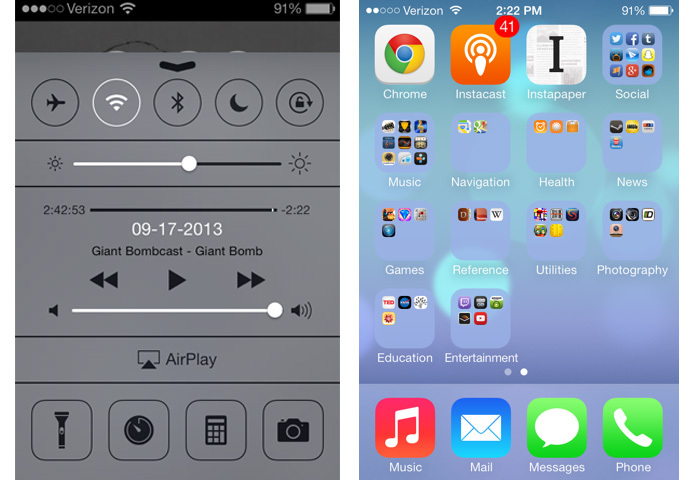 I think iOS7 is a worthy update. It’s very detail-oriented, and I appreciate that. Lots of little things are sprinkled throughout the whole package that you would look at and go, “Oh, that makes sense.” Countless times I would be dinking around in different apps, and find a neat little feature which made me wonder why it wasn’t there in the first place. On a whole, I still use my phone for the exact same purposes as a few weeks ago, instead now everything is shiny, new, and in a way, kind of impressive in the way Apple reminds us just how much smart stuff is crammed into their sleek, successful little device. In terms of features (you know, something that is actually a new feature, instead of smart tweaks), the big ones are a shiny new Control Center, Smart Multitasking, and AirDrop. The last of these I didn’t get to really mess with as it wasn’t an update that applied to my iPhone 4s. It was successfully installed on my iPad mini, but I haven’t gotten around to sharing anything with anyone. Maybe keep an eye out for an update. For now, here’s this review to check out on that specific feature. The control center is probably my favorite part so far. It’s accessible all the time, whether the phone is locked or not, and you’re able to access airplane mode, wifi (on/off), bluetooth (on/off), do-not-disturb mode, lock the orientation, screen brightness, music playback, volume, a flashlight (I can delete that app now! ), clock (great for setting alarms), calculator, and camera. Isn’t that a lot to pack into a simple control panel? After writing it down it seems like a lot to me, and I’m impressed with how well that all is presented. It may not be an original idea, but it certainly is welcome. Smart Multitasking is something that really makes me wonder what has been going on underneath the hood this whole time. In the previous update, multitasking allowed you to flip between apps with ease, just like the name of the feature would have you believe. With this new update, outside looking in, it appears that it’s simply just a different layout. However, Apple boasts some pretty crazy changes under the hood. Supposedly, different apps will be brought to the forefront depending on things like time of day, how often you use certain apps and at what times, if there is good phone service, the state of the battery and more. So if I walk into a place that has terrific wifi that I’m hooked up to, my iPhone will update some of the more internet-intensive apps in my multitasking queue. If I tend to check Facebook and Twitter at around 9:00am, my phone will make sure that those are ready to go by then. It sounds pretty neat, though it quickly becomes incredibly hard to parse through exactly how the system “knows” to do these things. For some, this would be a great place to diverge into a topic about privacy concerns, but I see no reason why these aren’t updates that are for the convenience of the user. So what if my phone does creepy stuff behind the curtain? I only benefit from these things. That’s the basic philosophy of technology after all. Having had the time with iOS7 that I have, I can say I am truly impressed, and satisfied with my phone. Sure, the design is “the start of a new chapter for iOS”. Sure, it’s the “mobile OS from a whole new perspective”. What this really is, in my honest opinion, is the security and peace of mind; knowing that the people who made the device I rely on everyday of my life are constantly at work with only two things in mind: me, and my experience with their product.